In part 1 of A Possible Work Round For Pro Tools 11 Video Engine Problems Mike Aiton outlined some of the problems and experiences and is now ready to outline how he got on with the AJA IO XT Thunderbolt box and an AJA Kona 3G PCIe card instead of his Blackmagic Decklink Studio PCIe card. The AJA IO XT is a half rack width 1U box with an external psu on 4 pin XLR. It connects to your Mac or PC via Thunderbolt. There are a plethora of SDI and DVI I/O options to connect to your digital picture world. I downloaded the AJA IO XT software and installed it along with the AJA Avid Open IO plug-in that allows Avid software to talk to the IO XT software. I connected the Thunderbolt cable, the analogue video out and references on BNCs and powered up. I loaded my long form mix with the ProRes Proxy Quicktime, DHxHD Quicktime and DNxHD MXF media which as you can see from part 1 caused me a lot of problems. The AJA software installs an AJA control panel in the OSX applications folder. I couldn’t find the setting for making the analogue BNCs be composite rather than a YUV output. I set the output of the card to be colour bars, but could only see a monochrome output (the ‘Y’ or luminance signal). Upon loading my Pro Tools 11 session, the AJA control panel had a reassuring red “in use by Avid” flag in the top right hand corner. I could see my pictures, but again in black & white. Feeling stumped, I fired an email to AJA support in California, not expecting a reply, I then decided to phone (just for fun) and leave a message, but to my surprise I got straight through to a very helpful support team (it was 4pm BST and I thought California was still asleep!). They informed me that they had already emailed me back (I missed it) and proceeded to explain that the composite selection option was regrettably left off the control panel version, but there was a “classic version” also installed which had this option. They confirmed that I had done everything else correct and had correctly set up simultaneous down convert from the 1080i. After opening this “classic version” I was cooking on gas and the Y output became CVBS (composite). 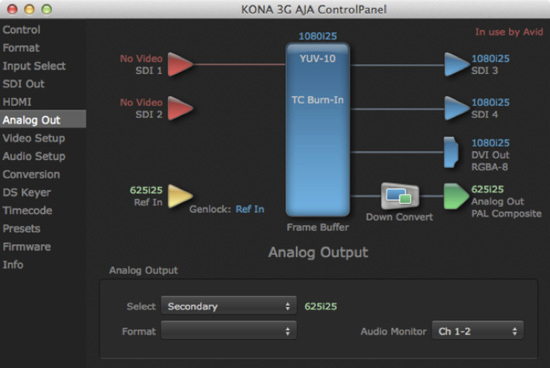 AJA Support also confirmed that it was OK to install the drivers and Kona 3G card simultaneously. A friendly support team and 15 minute email reply turnaround – they obviously take customer support very seriously indeed! By comparison I am still awaiting a reply from Blackmagic with a tech question from six months ago….. I had the session open for hours – looping away with incredulity and with the scrub with video hardware option selected as well. I just couldn’t make this box crash the AVE. It was much more responsive than my BM card and felt like an Aston Martin in comparison to a Mini. I didn’t “measure” performance from a play start – I am not really equipped to test that, but as a user I can say it was snappy. I even tried to break this box with my h264 Disney session, not even with looping would it cough or hiccup. I am a smitten kitten! This is “one dandy box mamma”! Scrubbing video was not quite as smooth as Avid mxf media through a Mojo in PT 10, but was way better than my Blackmagic card in PT 11 with none of “the three frame jerk”. I suspect this will only get better as the AVE improves. The only slight downer was a small amount of fan whine from inside the box. I would be happy to use this box in a session in front of a client – and not expect the misery I experienced with the Blackmagic card. I bet those without thunderbolt are getting jealous! For the non thnderbolters out there, there is a PCIe card option, which apparently is to all intents the same as the inside of the IO XT. The card seems to want to go in a PCIe x4 slot (alongside my HDX card) and not in the shorter slot that my BM card went in to. Check the size of the pins by the yellow sticker on the foil. The AJA card is on the left, the BM card is on the right. After installing the Kona 3G driver, I had to update the firmware on the card to the latest. A quick 45sec and reboot later and I couldn’t get any picture out of the composite output (yes again). After calling John England at Digi-Box.Co.Uk, we were a bit stumped until we realised that I had left the thunderbolt IO XT plugged in and that was still outputting composite video. Duoh! After a swift turn off, de-plug and reboot I was cooking on gas again. I achieved the same great performance from the Kona 3G card (which is mind-blowingly capable of even 4K resolution - if that is your bent). After looping a 2 sec piece of video for over 30 minutes whilst I started to write this review, I did eventually get the “Pro Tools video Hardware is no longer referenced” issue – which then requires a reboot (forget trying to re-connect to the AVE, you will drink the next shipment of Beaujolais first!). The only other issue that I could find was that after a re-boot, the composite video switched itself off again and I had to open the “classic AJA control panel” and remind it to play nicely. I suspect this flag for preference is not sticking, as it is not in the full version. Small chips though, and I am sure that it will be rectified shortly in the next revision. AJA engineers were apparently instrumental in helping Apple design the QuickTime engine – and you can really feel it. These products are light-years ahead in response and stability compared to the BM cards. Industry colleagues, I am wondering if we have got it all horribly wrong, and been guilty of “me-too-ism” in buying BM cards, as despite Avid’s “supported” status of BM cards, they have been nothing short of a disaster with PT 11 so far for me. I don’t know what fixes Avid are rumored to have up their sleeve (and they had better have something very soon to appease their irate customers), but all I can say for sure is that these AJA video solutions are, so far in my initial testing, way better than my Blackmagic Decklink Studio! “The king is dead, long live AJA”!